Aug 28 – Sept 6, 2016. Visiting Bangkok, Pattaya and Coral Ko Lan island. Also includes 6 local tours, 3 group dinners and 1 pool party. Attention: Airfare is only $636 right now on Hipmunk.com. 9 Days, 8-Nights, 4-star hotels. We will take tours, have groups dinners and pool parties! You need to buy your own airfare and hotel accommodation or get a group package. This trip is organized for London New Tech, Paris New Tech and Santa Monica New Tech. Thailand is the easiest country to travel to and around. On this trip we visit many exotic and beautiful places, meet locals and eat good food. 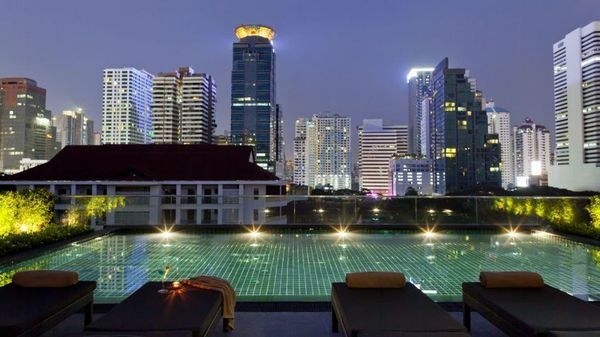 We will spend 2 days in Bangkok and 6 days in Pattaya, famous workaway destination. Why are we doing it? Many people prefer to work in warm countries with low cost of living, especially if they work in startups. Some Canadian, British, Russian developers work from resorts in the Philippines, Thailand, Cuba, etc. So we will be visiting one of the most popular workaway destinations as tourists and meeting local and foreign entrepreneurs! Day 1, Sun Aug 28: Departure Day. Day 2, Mon Aug 29: Arrival in Bangkok. Check in at U Sukhumvit Hotel or another hotel of your choice. Free Day. Day 3, Tue Aug 30: Optional tour of Bangkok or trip to the ancient capital Ayutthaya. Group Dinner. Day 4, Wed Aug 31: Travel from Bangkok to Pattaya by shuttle (2 hours). Check in at Jomtien Palm Beach Resort. You can always pop in for a couple of drinks and a game of pool, or simply to chat with other people, just as you would in your local pub back home. Other than skeptics and first-time visitors might think, bars in Pattaya don’t necessarily have that sleazy “red slight” atmosphere that might alienate non-male visitors but are invariably friendly places where virtually anyone looking for a fun time is welcome. Drink prices are reasonable, i.e. probably cheap when compared to what a beer may cost you in a pub in your home country. The girls are always happy to entertain their guests with a game or have a chat with you; alternatively you can just listen to the music and enjoy Pattaya’s unique nightlife atmosphere. Group Dinner at one of the best restaurants in Pattaya. Day 5, Thu Sept 1: Pattaya. The Nong Nooch Gardens Tour. It is the biggest and most beautiful botanical garden in Southeast Asia. More than 2,000 visitors from around the world visit this garden daily for their enjoyment. Nong Nooch garden is also dedicated to education, preservation, research as well as the conservation of its vast palm collection and other tropical plants. The entire area of some 500 acres is beautifully landscaped, with orchid nursery and other botanical gardens. Located on an over-70-acre piece of land, this park and farm hosts thousands of crocodiles, both saltwater and freshwater, living in shady natural surroundings. It is not only a living museum of curious and beautiful things of all the three kingdoms-animal, vegetable and mineral, but it also offers you several kinds of amusing and exciting shows. Group Dinner and Show at Thai House Restaurant. Day 6, Fri Sept 2: Pattaya. Elephant ride and jungle trek (optional). This tour takes you to the elephant round-up at the Elephant Village that is literally a large gathering of herds of elephants. Mini Siam Tour, a miniature city, offering replicas of sacred places and important historical sites around Thailand at a scale of 1 to 25. Such outstanding architectural works are, for example, the Temple of the Emerald Buddha, Democracy Monument, Anantasamakom Throne Hall, Wat Phra Srisanpet, Bridge over the River Kwai, Prasat Hin Phimai, etc. Also miniature versions of European structures. Group Dinner at Ruen Thai (optional). Day 7, Sat Sept 3: Pattaya. Tour to Coral Ko Lan island with water sports. Alcazar show (optional). Alcazar Cabaret Show in Pattaya City has all the allure and razzmatazz of a Las Vegas nightclub. Dazzling performances by artists in glittering evening gowns thrill nightly audiences, as well-groomed ladies mime and dance against a backdrop of surround-sound and computerized lighting. The unique feature of Alcazar’s entertainment, that sets it aside from Las Vegas, is that all the girls are boys! Or Thepprasit Road Night Market (optional). Day 8, Sun Sept 4: Pattaya. Underwater World (optional). It is Pattaya’s newest tourist attraction, the largest and most modern ocean aquarium in Asia, boasting a 100-meter-long, 6.4-centimeter-thick acrylic pedestrian tunnel through an underwater environment filled with dozens of marine species. The new theme park covers a total area of 12-rai and is housed in a structure similar to a large circus tent. The aquarium houses more than 4,000 marine animals, comprising more than 200 different species from the region as well as some rare creatures from overseas. Cartoon Network Amazone Water Park (optional). Group dinner at Kim Restaurant (optional). Pool Party with local and foreign Entrepreneurs. Day 9, Mon Sept 5: Departure for Bangkok. Tour of Sin Torture park, Monkey hill and Shrine. Travel from Pattaya to Bangkok by shuttle. Depart Bangkok the same night. Day 10, Tue Sept 6: Arrival at your home. Trip Price: You can purchase airfare and hotel accommodations on your own and just pay as you go for tours and group dinners. EVA 5 – 12:50pm, Sun Aug 28 • Los Angeles (LAX) 5:05pm, Mon Aug 29 • Taipei (TPE) Layover in Taipei 3 hour 20 min. EVA 206 – 1:40am, Tue Sep 6 • Bangkok (BKK) 6:30am, Tue Sep 6 • Taipei (TPE) Layover in Taipei 3 hour 40 min. You can also pay for Land Only package: $950 – Double Shared Room or $1,250 – Single Room. Includes hotel accommodations, breakfasts, 6 local group tours, 3 group dinners, 1 pool party and group transfers. Airfare is extra. More Info: Minimum group size is 6 people. You will be responsible for your own travel insurance. TO BOOK THIS TRIP please email the organizer of the group and this trip at polyachka@hotmail.com.